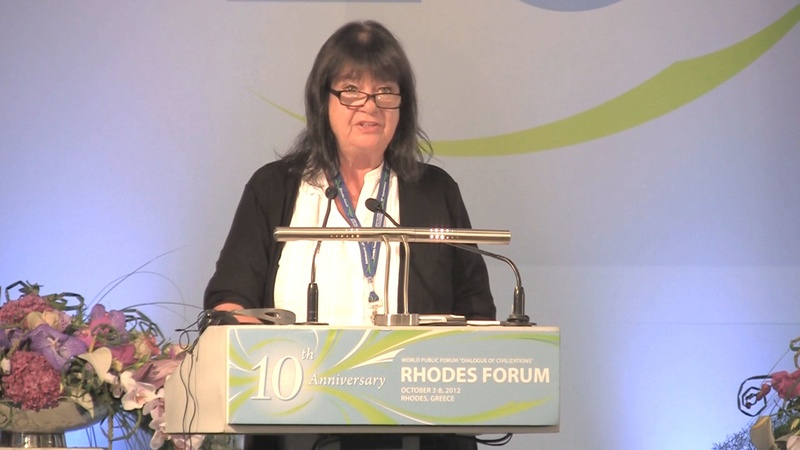 The following address was delivered by Helga Zepp-LaRouche to the Oct. 7 closing plenary of the World Public Forum Dialogue of Civilizations, Oct. 4-7, 2012 in Rhodes. During the last weeks, the existential danger in which the human species now finds itself has become clear for all thinking people. The almost continuous policy of "regime change," which after the collapse of the Soviet Union, "bombed Iraq back to the stone age," plunged Libya into anarchy, turned Afghanistan into a nightmare, and victimized the secular state of Syria with foreign intervention and religious warfare, in the case of military operations against Iran, could lead to an uncontrollable worldwide wildfire. The Near and Middle East threatens to become a new Balkans, in which existing alliances like those before World War I lead to a conflagration. The unthinkable could occur, that Mutual Assured Destruction no longer functions as a deterrent, but becomes the consequence of a war in which thermonuclear weapons are deployed, leading to the extinction of the human race. Not at some possible time — but within the next weeks. The dynamic which is driving the war danger, is accentuated by the accelerating collapse of the transatlantic financial system. Bernanke's euphemistically named "quantitative easing III" liquidity expansion is just as hyperinflationary as Mario Draghi's "whatever it takes," unlimited purchase of state bonds through the European Central Bank. Hyperinflationary money printing, in connection with brutal austerity — in the tradition of Reichschancellor Brüning — against the population and real economy has already had a life shortening effect upon millions of people in Greece, Italy, Spain, and Portugal and threatens to plunge Europe into a firestorm of social chaos. Despite having all the scientific and technological means at hand to guarantee humane conditions of life, while there are over 1 billion people subject to hunger and malnourishment, while 25,000 children — a small city — die daily from hunger, while 3 billion live in poverty and are denied their human rights, is it not then our sacred duty to actually deploy those means? We need a large-scale development strategy, building on the ideas of the United Nations Development Decades of the 1950s and '60s, rejecting completely the paradigm change of the past 40-50 years as the wrong track, and thus reviving the idea of "Peace Through Development." We either act now, in this moment of existential danger, on the common aims of mankind, or we will not exist.